I have seen these divine products around and about the blog world with the gorgeous kaftans and little shorts...I really took notice of their beauty as i saw that Plum Pretty Sugar also have divine bed linen in their collection. I always find it really difficult to find beautiful linen at an affordable price and these stunning prints and colours really tickled my fancy. I think i will definitely purchase the linen in the print below. Do they tickle your fancy too? I'd love to wake up in the bedroom in the first picture wearing that flowered robe! It's got a real twist to it. Love the shorts and robe. What gorgeous fabric all stunning, hope your day has been better today Kellie? Such pretty, happy fabric. Thanks for sharing! Nice designs and great color. Of course I dig the yellow Downton poster - he is one hell of an artist. Per your question: the Stallone illo took me about a hour in total, I worked on it b/w projects ;). It's always fun to have a doodle on the side! Thanks so much for inquiring. I could see myself owning the bed linen in the first photo. The shorts and robe really do... tickle my fancy, as you said! Haha, however I don't think I could ever pull those off. These prints are to die for! You're so right, it's very hard finding pretty and affordable linens. I really like Plum Pretty Sugar. 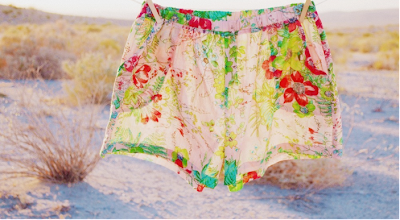 The prints are just so charming and carefree. I've been coveting the robe for a while now... but I must stay focused on house expenses, not beautiful clothes! Not 100% my taste but I can definitely appreciate their beauty! Oh wow I love these! You know how I love my muted tone...but these are gorgeous, so happy and vibrant! Tickle...yes. They are all sooooo pretty! Oh my! That first bedroom interior is so pretty! The patterns are great together. I would have never thought to put those two together but it totally works! 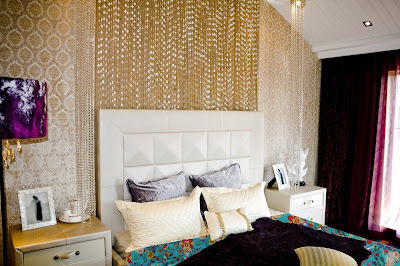 I love that headboard on the last photo! P.s...regarding my post: I've given up woth the excuses...we don't need excuse, we always need a new pair of shoes! i didn't know about their linens collection - love it!!! btw, i just wanted to let you know that we awarded you the I Love Your Blog Award! You can see the award in today's post on our blog! Feel free to pass it along to those other blogs you love!! Love love lovin' it all!! Thanks for sharing such a gorgeous find Kellie. oh yes! they ARE pretty prints! They are just beautiful! That first picture makes me happy. I would love to have a few pops of colour like that. Ahh pretty linen would be great to have. i've got to get those shorts! they are so perfect. i am still so in love with your blog, my new fave! I want everything in this post, it's all so lovely. I love that robe! I don't even wear robes, but I would wear that one. I found them accidently on etsy & have been addicited ever since. I can tell you things are wonderfully made too!!! 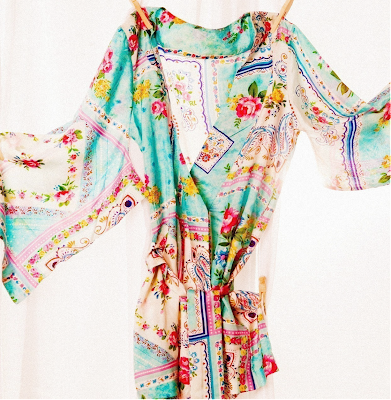 The robe everyone is coveting is fabulous!!! those fantastic wallpapers... i love the gold. yes, i'm very drawn to these patterns! i'll be checking out the plum pretty sugar site after this word :) there is something so sweet and cheery with these!